Kids clothes usually divide into two broad camps - the preppy camp and the colourful camp. I love both really, but at a recent children's wear trade show I specifically checked on the colourful camp. I got to see and photograph (some) new bright and fun spring and summer 2017 children's wear collections hitting the shops in January. Last year I went to the same show and did an update on a few of my favourite up and coming British children's fashion designers. Collectively, walking around and looking at the collections you could see that colour was going to be again a big thing. Unsurprisingly nautical motives, sea creatures, and all that you often associate with spring and summer were there. There was plenty of bright primary colours, however, it almost seemed like there was a bit of a muted edge to the primary colours with a bit of toning down. Pastels were also looking like they are again up and coming. Organic is again really popular, with many brands being certified by GOTS to be of the highest standards. So here are a few of my pictures from Bubble London. Olly & Arya - a totally NEW brand, launching in 2016. Stylised photographs digitally printed on bamboo, tencel and cotton fabrics, and some simple and homely knitwear. I thought this brand was lovely, they had some very unique clothing, and I especially loved the dinosaur jersey and I think any kid would go nuts for it. I seem to remember the original photograph is from the film Jurassic Park! Småfolk - Danish brand that I have also associated with strong retro colours is going a lot more pastel this time around. They were especially proud of the fact that they are now certified by GOTS, as organic textiles is something they feel strongly about. Pastel and prints - I like it! Lilly + Sid - such a huge favourite here in UK, they do just the cutest designs, for both girls and boys. Usually the stuff available for boys is a bit bland, but not at Lilly + Sid - they have really fun designs for both genders. I picked up that there were a fair bit of mermaids for girls and octopi for boys this coming summer. Tiny Trolls of Norway - I am a big fan of Scandinavian brands and they do the practical outer wear the best. Like they say in pretty much everywhere in Scnadinavia, there is no bad weather, just bad clothes. Tiny Trolls of Norway do lots of high-quality winter suits, overalls and rainwear, plus of course fleeces and proper outdoorsy gloves for kids, and are now moving to make it big here in UK too. I especially loved the dusty pink and dusty purple rain suits - gorgeous colours. 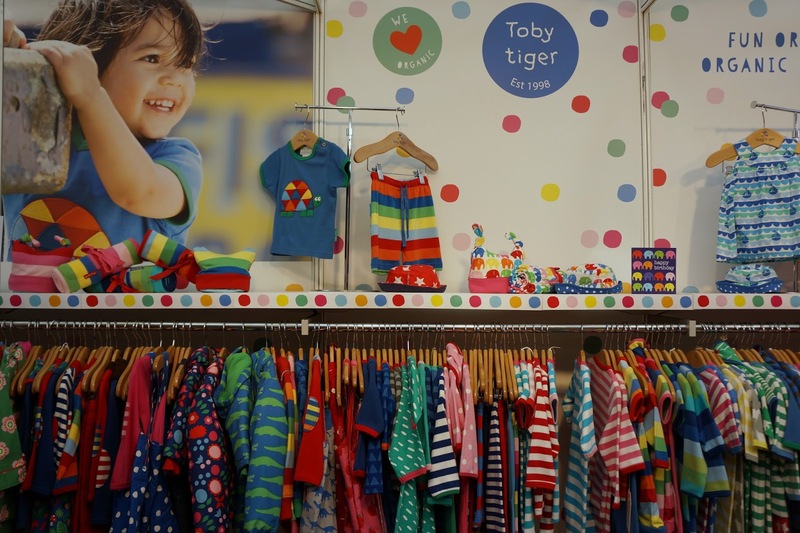 Toby tiger - I have to confess, I had never heard of this brand even if they are quite established, but I loved the colours so was drawn to their stand. Still bold primary colours, but also pastel edge to them. I loved the colourful elephant prints that remind me of Elmer the Elephant. Unfortunately I didn't have time to pop by down all the stalls, and some stalls I did pop down didn't want any pictures of their closely guarded designs published ahead of embargo, but I can tell you, it is looking nice and colourful out there in spring! 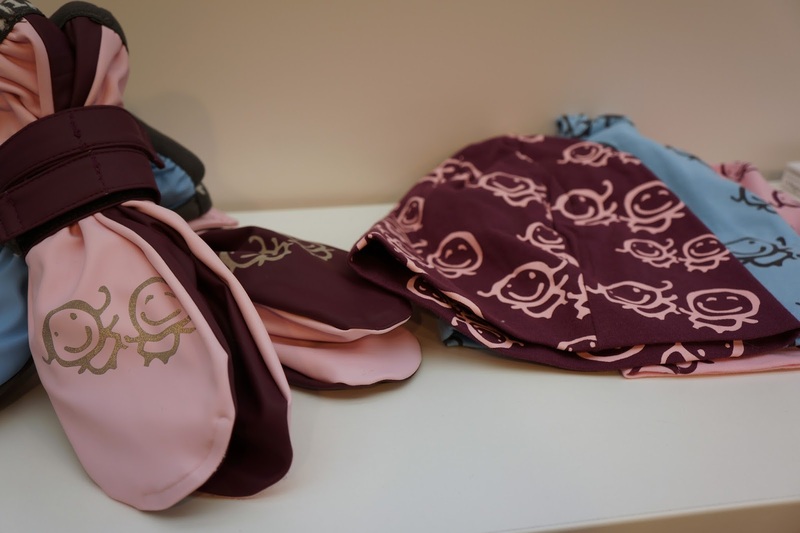 A few other nice colourful brands I saw were Kite, Hatley, Frugi and mini Melissa, but for one reason or another didn't have a chance to photograph their stuff. What did you think of the collections? Looking forward to the spring and summer fashion for kids? Yeah this was a first time I saw Toby Tiger too, and they had some lovely stuff :) Will have to check out their website soon! Lilly & Sid are such blogger favourites aren't they! I see lots of people sporting their stuff on blogs, and I am not surprised why. They always have such cute designs :) Thanks for hosting! Yeah I really liked Tiny Trolls of Norway - such fab clothes, and we quite like our daughter wearing these kinds of very practical outdoor clothes in autumn and winter wet weather. Thanks for hosting! I'm obsessed with the new Lilly & Sid stuff - it's divine! I was hoping to make Bubble & Dot-to-Dot but timings were off with our visit to Sussex :( . It is really interesting, I'd definitely recommend coming if you are interested in kids clothes and want to cover some of the new trends (and if you do come, let me know and we can meet up :) ). I really enjoyed having sneak peeks at the collections although I wasn't allowed to photograph all of them.